Home » Does the Breville Barista Express Live Up to the Buzz? Does the Breville Barista Express Live Up to the Buzz? Making the perfect cup of coffee is easier said than done! A crappy coffee machine can turn even the best high-quality roast into a cup of swill, something no amount of sugar or creamer can make up for. On the other hand, a good coffee machine can produce liquid gold even from the lowest-quality beans. The Breville Barista Express is a compact espresso maker, but one that brews amazing-quality espressos. It’s a semi-automatic machine that requires very little in the way of cleaning and maintenance. Best of all, it’s built from stainless steel. No plastic on this bad boy–you get a machine built to last! There is a bit of a learning curve with the Barista Express, especially for those used to pod coffee makers. But once you get the hang of it, you’ll be addicted to the delightful brews it produces. Water Tank Capacity 67 oz. 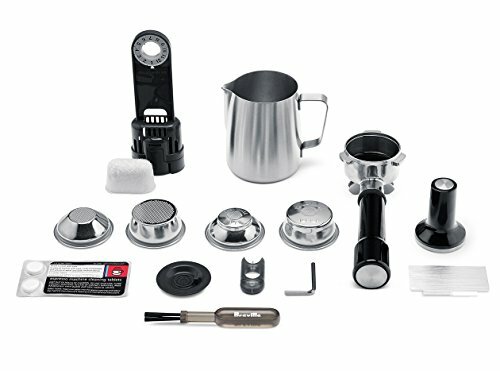 In addition, the Barista Express is sold new with a stainless steel milk pitcher and cleaning accessories, including a cleaning disc, cleaning tablets and a cleaning brush for the conical burr grinders. This machine is designed to produce the freshest possible cup of coffee. It has a sealed bean hopper capable of holding up to half a pound of coffee beans. The conical burr grinder will produce fresh coffee ground on demand, pouring the ground directly into the cradle. A fresh cup of espresso in under a minute! The 15-bar pump and 1600W Thermo Coil heating element guarantee a balanced, full-flavored brew in less time, thanks to its accurate water heating. The machine allows you to use both a single and double-wall filter basket, enabling you to produce the right amount of coffee according to your filter. With the pressure gauge, you can ensure the machine isn’t producing too much steam for your espressos. Want to change the size of your coffee cup? Simply switch the volumetric control to the desired size and get brewing. Cleaning this machine is surprisingly easy. The built-in cleaning cycle will run water through the espresso maker, getting rid of any traces of yesterday’s coffee. The removable drip tray prevents messes on your counter, with a partition for both dry and wet spills and a light to alert you when it’s time to empty it. It’s a user-friendly coffee machine, once you get the hang of it. Coffee Quality — If you are looking for café-quality coffee from the comfort of your home, this is the best machine for you! The Barista Express churns out fresh coffee on par with the best of your favorite coffee shop, and at a much lower price than the commercial coffee makers. Customizable — With this machine, you have total control over the coffee you make. You can change the size of the cup, the amount of steam used to extract flavor, the amount of coffee ground used per cup, and so on. Though it’s a bit tricky to learn how to use the machine to its full extent, once you do, you’ll love how easy it is to customize your perfect cup of coffee. Durable — Made from stainless steel, this is a coffee machine built to last. The steel is stain-resistant and waterproof, and you’ll find that the coffee maker lasts for years to come. Even the internal components are built of durable materials. It’s a long-term investment in quality coffee. User-Friendly -­- Thanks to the sealed bean hopper and the 2-liter water tank, you can produce a few dozen espressos without needing to refill coffee beans or water. The machine can also go a week or three without needing cleaning. Price — At $600, this is a pretty pricey investment for the average coffee drinker. (Of course, you can find the lowest prices and discounts!) Coffee enthusiasts will have no problem dropping this kind of money on a machine of this caliber, but if you’re only an occasional coffee drinker, you may not be willing to pay the high price. Learning Curve — There are a lot of dials, knobs, and buttons on this coffee maker. It can be a bit daunting at first, especially if you’re used to automatic coffee machines. However, the user manual makes it easy to learn how to use the machine to its full extent. Take the time to read it, and you’ll learn the coffee machine in no time. Not Automatic — For many users, it’s too much effort to learn to use the machine. If you are looking for a fully automatic coffee maker, you’d be better off looking elsewhere. This is a semi-automatic machine, so you’ll have to learn how to use it if you want a quality cup of coffee. 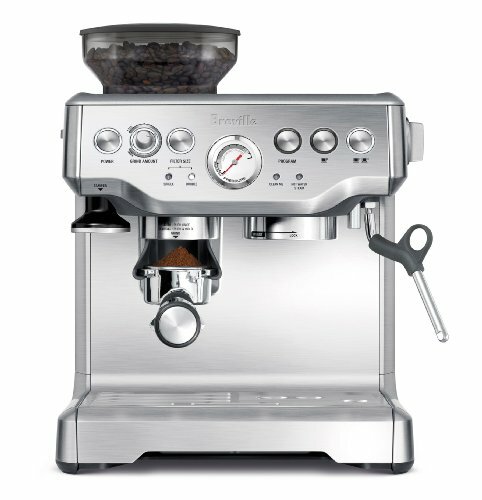 Buzzing — A number of Breville coffee makers have problems with the solenoid electromagnet used for the heating element. After a year or so, it begins to buzz, leading to low heat/steam pressure. A number of users have reported the Breville Barista Express has developed this problem. Love at first sight might be overstating it a bit, but there’s no doubt the Barista Express is a fine looking espresso machine (especially the red, or ‘cranberry’, one). In addition to taking pride of place on the kitchen counter, the compact and efficient Barista Express packs a lot into its small frame. The main thing to note is that this is a semi-automatic espresso machine. This means that while it does some of the hard work for you, some effort is required to produce great espresso. To get the most out of the Barista Express, you really need to put on your barista hat and get to grips with all the functions on offer. For complete newbies, Breville has made life a tad easier by supplying two dual-wall, pressurized filters. These regulate pressure and help optimize the espresso extraction. For the more experienced, there are two single-wall, non-pressurized filters. These provide added user control over such variables as grind size, grind amount, and tamping pressure. The Barista Express also allows you to adjust the temperature, if required, in two degree increments. However, the standard pre-set 200F (93C) should be more than adequate for most users. Other choices to make include whether to pull a single or double shot of espresso, with included preset one and two cup volumes and manual override. Despite all these options, the Barista Express is largely user-friendly, with a clean and simple control panel and large buttons to make your setting selections. There’s also a pressure gage and simple automatic doser. The top-located bean hopper is easy to fill and has a locking feature, so you can easily remove it, change beans and store it separately. The 67-oz removable water tank is reasonably easy to fill and has adequate capacity for medium-heavy use. The Barista Express makes it possible to produce great espresso at home, whether you choose to keep the factory presets or to experiment with the other settings. Once you get used to the basic functions, it’s worth taking some time to experiment with the settings as small changes can make a big difference. Even though it comes with 18 available grind sizes, for espresso the best choice is one of the finer grinds. In terms of choice of coffee beans, dark, espresso, or French roast produce the most café-like espresso (but you can also try medium roast). The Barista Express offers the option to use pre-ground coffee, but for the best results it’s advisable to stick to whole beans. The milk wand is terrific, but does take some getting used to. If you’ve never steamed milk before, be prepared for some messy counter tops and flat froth-free cappuccinos for a while! However, part of the fun of owning a machine like this is having the chance to play around and develop your barista skills, in both espresso making and milk steaming. One of the great things about the Barista Express is that is doesn’t skimp on quality, despite the fact that it’s priced at a level that makes its accessible to the home barista serious about making great espresso but unwilling or unable to shell out thousands of dollars on a fancy high-end machine. Indeed, at around the $600 mark, justifying the expense of the Barista Express is pretty easy, as it works out to less than six months’ worth of espressos (to feed a modest caffeine habit)! At this price, it would also make a great wedding gift for a coffee loving couple. 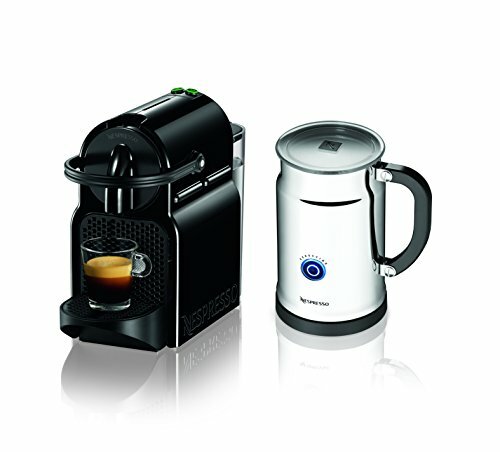 The Barista Express also comes with lots of great extras, including a milk pitcher and cleaning equipment; items that often need to be purchased separately when buying other much more expensive espresso machines. There is also a quality tamper that is handily stored by attaching it magnetically to the machine. Overall, the Barista Express is a pleasure to use and really hard to find fault with. When it needs attention, the Barista Express displays an unmistakable ‘clean me’ message. This requires back-flushing the machine using the (supplied) cleaning disc and tablets. You need to ensure the water tank is full and the portafilter in place. The cleaning cycle takes around five minutes and full instructions are supplied. Other cleaning and maintenance requirements are to clean the conical burr grinders with the supplied brush and to clean the other removal parts, including the portafiler, filter baskets and drip tray. It is important to clean the steam wand after every use by wiping with a damp cloth and flushing through some steam. Additionally, there is the decalcification process, which requires periodically running some vinegar and water through the machine. Again, full instructions are supplied in the user manual. Breville recommends replacing the water filter (if used) every couple of months to reduce the frequency of decalcification. Nespresso Inissia Espresso Maker — At $100, this is a well-priced espresso maker that produces a pretty great cup of coffee every time. 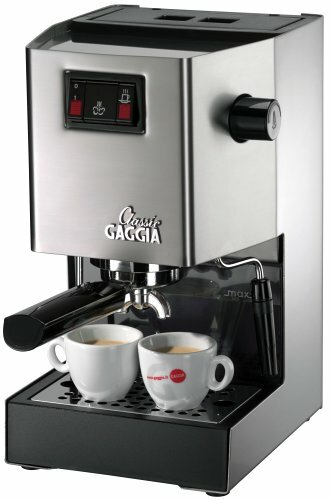 It has a 19-bar high-pressure pump, and will churn out a cup of espresso in just 25 seconds. However, it lacks the additional elements of the Breville Barista Express (no coffee bean hopper, a small water tank, etc.). It’s a much more compact machine, so it’s worth considering if you have less kitchen space. 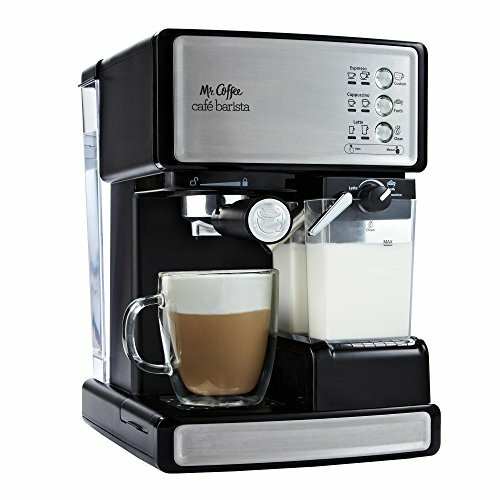 Mr. Coffee Cafe Barista Espresso Maker — This is a much more automatic machine, with a one-touch panel that will churn out single and double shot espressos, lattes, and cappuccinos. There is even an automatic milk frother for those who have to have their coffee foam. If you want a fully automatic coffee machine at a decent price, this $150 machine is a good option for you. 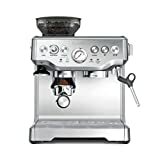 Gaggia 14101 Classic Espresso Machine -­- Made from quality stainless steel, this coffee machine is able to produce a quality cup of espresso with the press of a button. It has a larger water filter than the Breville Barista Express, but without the customizability. At $395, it’s a slightly cheaper coffee machine to consider. The price tag on the Breville Barista Express is no joke–$600 is a hefty price to pay for a coffee machine. But if you want only the best, freshest cup of coffee at home, it’s a worthwhile investment. The machine gives you total control over your coffee, making it easy to produce the “perfect” espresso in under 60 seconds. Previous Post: « What is the Best Way to Store Coffee Beans?